Electrical wall outlets are finally catching up with technology. While the old electrical outlets delivered power, the new electrical outlets give the homeowner a choice of convenience, safety features, and other options. Today, we’re going to review some of those options. While we realize that a homeowner can purchase a plug-in or extension cord which may have some of these features, these outlets are for those who want their safety hardwired, without a lumpy addition sticking out of the wall. "The old electrical outlets were dismayed to learn they were being replaaced." Ground fault circuit interrupters, called ‘GFCI’ outlets have become code for outlets which are within six feet of water. Areas such as a kitchen or bathroom and out of doors are required to have GFCI outlets. They’ve saved people from many electrocutions over the years. 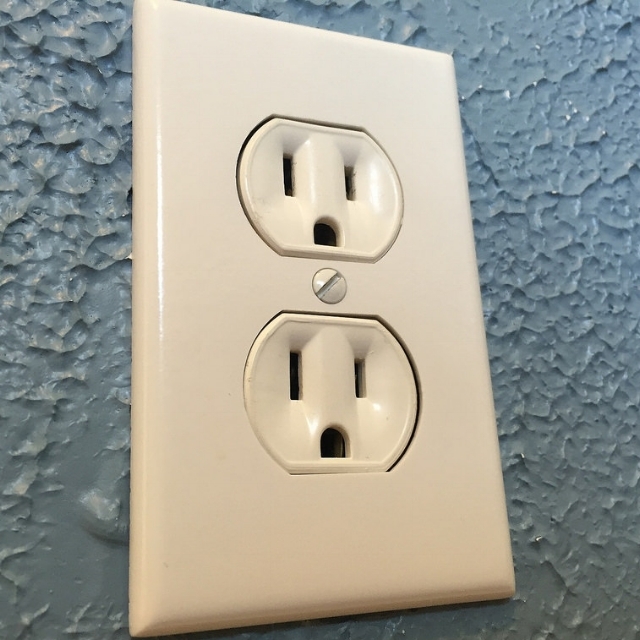 The recent death of a Lovingston, NM, girl who was using a frayed extension cord plugged into a non-GFCI outlet has reiterated the need for using a GFCI receptacles whenever there is the possibility that the user may come in contact with moisture. A self-testing GFCI is what it sounds like: the GFCI monitors itself for functionality. Whereas other GFCI’s can fail and continue to function, the new self-testing GFCI outlets will disconnect from the power source if the GFCI function fails and the indicator light will flash. If the GFCI fails, especially if the outlet is behind furniture or out of plain sight, a 60 dB (at ten feet) alarm will sound to alert the homeowner of a failure. Plus, if Junior tries to stick anything in the socket, he’s busted by the alarm. Tamper resistant receptacles or TRR have spring-loaded receptacle plates which cover those open outlet holes. Anyone who has ever seen how fast a two-year-old can insert a pair of tweezers, paperclip, keys or other tiny metal objects into an outlet doesn’t wonder why tamper-resistant receptacles are a good idea. What about a GFCI tamper-resistant receptacle with a nightlight? Photocell offers dark/on, light/off function, making this ideal for bathrooms, nurseries, and other areas where a homeowner might need a tamper resistant GFCI and a night light. The GFCI prevents electrocution and shocks while the AFCI preclude the possibility of fire. An AFCI can detect an arc fault, the primary cause of fires in wiring, and shut the outlet off. You choose--one, two or four ports. The one- and two-port options also have electrical outlets. The four-port option is all about the USBs. If you want to go Smart, you can choose a wifi ready outlet. Even though it requires a hub, this option offers the ultimate control for those who want to be able to control their electrical outlets from anywhere.